And just like that, the Bulgarian bracelet winner is out, slapping his cards down, defeated, after Idan Raviv took it all. Raviv opened from under the gun, making it 85,000 to play and originally it looked as though Francis-Nicolas Bouchard, in the small blind, was going to play. He asked for a count of Raviv (about 1.3 million), but folded, leaving it down to Naydenov in the big blind to look up Raviv. So it was just the two of them to a flop of 7♠5♦8♥, which Naydenov checked. 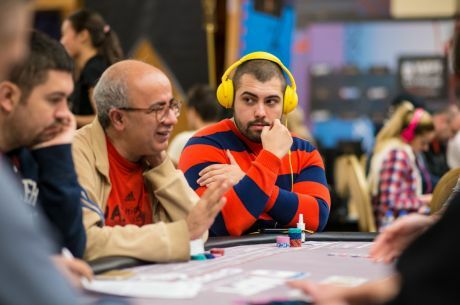 Raviv made a continuation bet of 115,000 and Naydenov called. The 6♦ came on the turn and both players checked, taking them to a 9♠ river. Naydenov announced pretty quickly that he was all in and Raviv didn't take long to call the bet, putting one chip over the line. Naydenov immediately slapped his cards on the table, face down, and it looked initially like a bluff gone wrong. But it wasn't even that: when asked to show (as a called all in must be) Naydenov showed his 6♥6♠ for a flopped straight draw, turned set and rivered straight. But Raviv calmly showed K♦T♦ for the rivered bigger straight and that was the end of Naydenov. He leaves in 32nd.